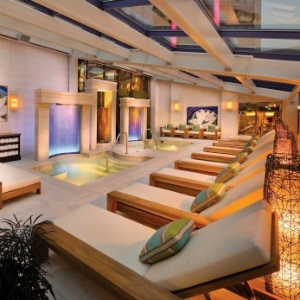 The luxurious Atlantis Casino Resort Spa in Reno, Nevada, has everything groups want in a destination. With the finest service in the perfect location, this AAA Four Diamond property is an all-in-one venue that checks off everything on a meeting planner’s wish list, including 50,000 square feet of flexible meeting space and a 30,000 square foot spa. Plus, it’s the only Reno resort directly connected to the Reno-Sparks Convention Center, which offers an additional 500,000 square feet of meeting space. Over the past year, Atlantis has completed a number of updates, including new custom pillow-top mattresses in all of its 824 guest rooms, new carpet property-wide, an upgrade to the Wi-Fi, and new state-of-the-art equipment in its Fitness Center, including treadmills and EFX and stride machines, all with 15-inch screens that allow guests to personalize their workouts based on their preferences. As part of its 50,000 square feet of meeting space, Atlantis offers two ballrooms — one with 14,000 square feet and another with 12,000 — along with enough flexible venues to accommodate groups of 15 to 1,500. All of Atlantis’ meeting space is in close proximity to guest room elevators, restrooms, the business center, and the high-tech Executive Boardroom, and all function rooms feature the latest high-tech features, along with HD screens that provide crystal-clear displays for presentations and videos. After meetings, guests can dine in one of eight onsite restaurants, offering something for every palate, from casual at Manhattan Deli to fine dining in the AAA Four Diamond Atlantis Steakhouse. A favorite among guests, the newly opened and redesigned Toucan Charlie’s Buffet & Grille features a variety of stations that go beyond the expected buffet fare. Guests may find made-to-order pho, Mongolian barbecue, a charcuterie board with a variety of meat and cheeses, and more. Following a full day of meetings, there is no better place to go to relax than Spa Atlantis, Reno’s only Forbes Travel Guide Four-Star spa. Guests are invited to discover unique treatments such as the Pantai Luar Eastern Asian massage or Cleopatra Milk and Honey Cocoon. Each treatment is designed with health in mind to provide its own healing properties. Atlantis features various lounges for guests to relax, including the Brine Inhalation-Light Therapy lounge, which brings a climate of an ocean shore, combining salt aerosols and chromotherapy to improve the respiratory system. Atlantis has earned industry accolades property-wide, including Successful Meetings’ Pinnacle Award. It was also named USA Today Travel’s No. 1 casino outside of Las Vegas and recognized as one of America’s Most Popular Casinos by Travel Channel. Nestled at the base of the Sierra Nevada, Reno enjoys over 300 days of sunshine each year. In winter, snowfall is light on the valley floor but heavy in the upper elevations. In the summer, highs are typically in the low to mid-90s. The city is known for its active summer season, full of festivals and outdoor activities, and is a mere 45 minutes away from Lake Tahoe, which features world-class skiing and beaches.